This is a landscape brimming with history, at every turn the Castles of Eden walk throws up clues to the past. The Cleveland Way is one of England's oldest and best-loved National Trails. It runs for 108 miles (174 km) around the North York Moors National Park, starting inland at Helmsley, offering panoramic views over the vales of York and Mowbray and from the Cleveland Hills. The Cleveland Way is a National Trail set in the beautiful wild countryside of the North York Moors National Park. This bundle of Harvey maps cover every step of the way across the country on the classic 191 mile Coast to Coast walk. And it saves you money! This challenging walk of 184 miles (296 km) crosses the north of England from St Bees on the Cumbria coast to Robin Hood’s Bay on the North Sea. 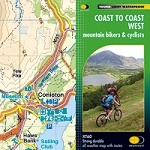 SAVE ££ on this TWO map set - Coast to Coast Mountain Bikers Cyclists map set. Covers the complete route in two maps. This set of EIGHT OS Explorer maps covers the whole route and gives you all the map information you need to get to the end without missing any of the amazing sights and places along the way. You can keep on the right tracks with OS Explorer maps because they show every landmark, house, river, viewpoint, hill, and right of way. Planning to walk the Coast to Coast? 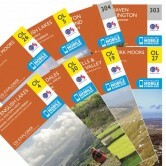 Then SAVE ££ with this bundle of EIGHT Explorer maps that cover every step of the route. Fabulous NEW edition of Trailblazer's classic guide to The Coast to Coast Path. The trail is 191½-miles (307kms) and runs from St Bees on the Irish Sea across the width of Northern England to the North Sea at Robin Hood’s Bay. This spectacular two-week walk crosses three National Parks – the Lake District, the Yorkshire Dales and the North York Moors. Originally devised by the legendary Alfred Wainwright, the Coast-to-Coast Walk has steadily become one of Britain’s most popular long-distance walks, and it is not hard to see why. This is the long-awaited brand new edition of what was the first guidebook to this classic walk since the Wainwright original. The Coast to Coast Walk has enjoyed a greater surge in popularity since recent TV exposure, and remains Britain's favourite long-distance walk. 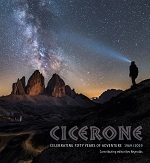 These pocket guide books provide the ideal companion for day trips, short walks and holidays. The vast county of Yorkshire is bursting with a bounty of stunning climbs that are the envy of the nation.